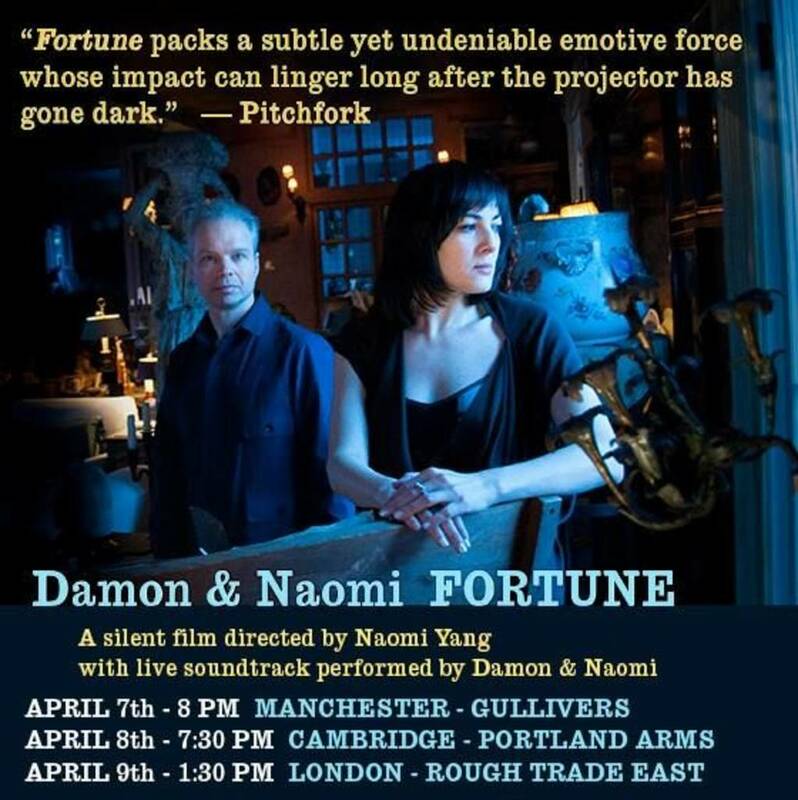 Damon & Naomi have announced some dates in the UK to support the release of their splendid new album Fortune. The shows will include a showing of the film with live accompaniment and (most likely) a few bonus oldies thrown in at the end. The show is well worth catching if you can make it. They then head off to Europe for more dates (which I post when I have them ready). The first few songs set the melancholy but not despairing tone. They blend together. They merge into a tapestry of introspective meditations on loss and recovery. They are dignified, and they drift along. Halfway into the sequence, “Shadows” stands out as a fine example of the layered, meticulous pace that Krukowski and Yang have mastered. Hushed, it does not let go of emotion, but it cradles it. But for the most part, this isn't mere incidental movie music; there is marvelous song craft here. Damon's voice strains to meet the haunting melodies of "Amnesia" and "Shadows" [...] The aching "A Shining Dream" is particularly moving. [...] Fortune doesn’t step beyond the bounds of what we've heard from the duo in the past, but it's a gorgeous, succinct statement that elevates the visuals it was written to accompany. With all the songs sounding similar, by-numbers production, underwhelming song lengths, and over all short running time, it sounds as if I’m describing a boring, forgettable album, but Fortune defies those synonyms and gives the listener a beautiful, personal, listening experience. It might be glorified background music for an early morning road trip, but sometimes we need just that to remind us how beautiful the simple things in life can be. Fortune is available on CD and LP and download from bandcamp.